ABOVE: MS Maribelle passengers go ashore in Lyon, France. On most river cruises, shore excursions are included in the fare. MS Maribelle follows this tradition by offering walking tours or bus excursions in nearly every port of call. Because the ship offers the same "French Vineyards & Vistas" itinerary every week from late spring through fall, the tours operate smoothly and (in our experience) the guides are first-rate. Free time. 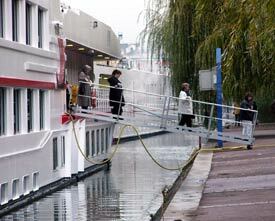 Tours generally return to the ship in time for lunch. Afternoons are usually free for independent sightseeing or shopping, except on days when the ship departs at lunchtime for an afternoon of cruising to the next city or town. Note: I saw many passengers tipping in American dollars, but it's much more thoughtful and polite to tip in local currency.